What have you been up to lately ? Any new books? I am ordering another copy of WHY ART MATTERS. It's one of those books that inspires-there are very few and you have to have them within arm's reach. 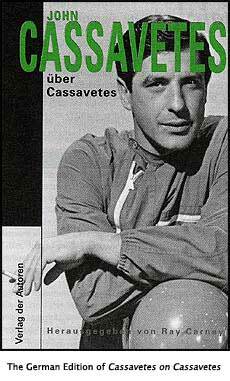 Cassavetes on Cassavetes is a masterpiece. RC replies: Thanks for the kind words about my work, Fred. Always glad to get a kind word. Too bad you're not Britney Spears or a sports star. At least, I'm assuming you're not a celebrity. I could use the endorsement. Regarding your query about my recent activity: The last ten or fifteen pages of the Mailbag more or less constitute a diary of things I've been thinking, reading, writing, and doing (including adding four new rooms to an old Vermont farmhouse) recently. About books: I spend all of my spare time in evenings and weekends writing, and have completed several long books, but none has been published. When one is, I'll send up more Mannheim rockets on the site than Mozart does in the last movements of his A-major symphony and D-minor concerto combined. Keep working for change. --R.C. You MUST find a way to watch this. I won't take no for an answer. It's breathtakingly beautiful and wondrous, a study in the expressions on women's faces. You will love it! The cello(?) accompaniment is great too. I'm not familiar with the piece though, do you know it? You posted a You Tube video link from a reader named Marty asking what the music is to a video of women's faces in art. You can let that reader know that it's the Sarabande from Cello Suite #1 by J.S. Bach. A note from Ray Carney: On the preceding page, I mentioned that some interesting films had come across my desk in the past few months (beyond the ones I programmed for the Harvard Film Archive "Under the Radar" Festival, click here to see the listing of those titles). One of the most fascinating of those films was initially brought to my attention by Aaron Katz (the creator of Dance Party and Quiet City) and sent to me for viewing by A.C. Abbott, the Assistant Programmer for the Dallas Video Festival (under the artistic direction of Bart Weiss). It's called The Whole Shootin' Match, and it's a laid-back, Southwestern buddy-boy movie directed by a young, first-time filmmaker named Eagle Pennel. Though the tone is comic, the film plumbs real emotional depths of sadness, yearning, and displacement in its depiction of two urban cowboys who dream of greater things than contemporary Texas -- or life anywhere probably -- can offer them. A very wonderful and interesting, funny and sad work. Though the movie was made in 1978 and received several festival screenings and a small amount of attention in the following year or two, it is one of many American independent films (like John Korty's Crazy Quilt, Funnyman, and Riverrun, for example -- or like Morris Engel's I Need a Ride to California, which is described in the note below on this page, or like the first version of Shadows) that has been more or less completely overlooked by subsequent film history and scholarship. A forgotten film. A lost film. I am deeply indebted to Ms. Abbott for "re-discovering" it and sending a viewing copy along to me. A side-note, after I viewed the movie, I wrote Ms. Abbott expressing interest in meeting the filmmaker and finding out what else he has done in the past thirty years. She wrote back: "Sadly Eagle died penniless on the streets of Houston many years ago. He drank himself to death." An excerpt from my response: "So sorry to hear that. It breaks my heart. But it is so typical of the indie scene. Neglect and ignorance." America does its best to kill its young artists--the really good ones, at least -- by ignoring them. Or they kill themselves or give up and abandon their art after a few years, because of the financial difficulties of attempting to tell serious truths in a culture dedicated to frivolousness and distraction. -- R.C. A note from Ray Carney: An announcement for a Boston indie film screening. Obligatory disclosure statement: I (Ray Carney) am an advisor to the Boston Independent Film Festival for film programming, special screenings, and other events. --R.C. Subject: Independent Film Festival of Boston screening of MANDA BALA (SEND A BULLET) this Thursday! The Independent Film Festival of Boston (http://www.iffboston.org) continues its monthly screening series this week with 2007 Sundance Film Festival Grand Jury Prize and Cinematography Award winner MANDA BALA (SEND A BULLET). Directed by Jason Kohn, this amazing documentary will screen this Thursday, August 30th at 7:30pm at the Somerville Theatre in Davis Square. Tickets are $8.00. Go to http://screenings.iffboston.org/2007_04.php to read more about the film. Don't miss out. Of the 30 films that IFFBoston saw at Sundance this year, this one was clearly the best. See it at the Somerville Theatre this Thursday night at 7:30pm. A note from Ray Carney: Another important NYC premiere of a film I recommend. (See Mailbag page 85 for an announcement about Aaron Katz's Quiet City.) Be there or be cubical! And say hi to Ronnie Bronstein from me!!! (Click here to read my description of the film when I played it at the Harvard Film Archive "Under the Radar" Festival.) -- R.C. "Dialogues on Film," a series of screenings and discussions with directors presented by IFC Center and Filmmaker Magazine and moderated by the magazine's editor, Scott Macaulay, continues with the New York premiere of Ronald Bronstein's FROWNLAND, winner of a Special Jury Prize at the SXSW Film Festival this year, on Wednesday, September 5 at 7:30pm . The filmmaker will appear in person to discuss his work and its place in independent cinema with Macaulay and special co-host Lodge Kerrigan, the acclaimed director of Keane, Claire Dolan and Clean, Shaven. A controversial and galvanizing film that provoked strong reactions at its premiere at SXSW, FROWNLAND was described in Variety as "the indie equivalent of a stiff drink. [It] amounts to a principled protest against standard filmmaking by tyro helmer Ronald Bronstein." The festival jury went on to award it a Special Jury Prize for its "uncompromising singularity of vision." Bronstein's director's statement calls the film "a jagged little pill of a movie, in turns scary and strayed, honest and threatening, funny, frustrating and frazzled. My own small contribution to the sinking barge of the 16mm indie film model; both an overripe tomato lobbed with spazmo inaccuracy at the spotless surface of the silver screen and a mad valentine to the craggy tradition of unadulterated cheap-o-independent expression." Named one of Filmmaker's "25 New Faces of Independent Film" in the 2007 edition of the magazine's annual survey of the indie film landscape, Bronstein also works as a projectionist for various New York arthouses. He financed FROWNLAND with his own savings, taking two years to shoot and complete the film. It is his first feature. Tickets for the evening are $11 General Admission/$7.50 Seniors, and free for IFC Center Members. IFC Center, 323 Avenue of the Americas at West 3rd Street, box office: 212 924-7771. I sometimes talk to my grad students and attempt to describe the profound satisfaction of devoting your life to scholarship. I try to emphasize that as scholars they will be doing something that won't necessarily get any attention or recognition in terms of the values of the world. Scholarship won't make them a lot of money. It won't get their names in the newspapers. It won't (if their experience is similar to mine) necessarily even earn the respect or admiration of their academic colleagues and bosses. But none of that matters. They will be doing deeply satisfying and soul-fulfilling work -- preserving and creating knowledge. This summer I had an experience that brought the beauty of scholarship home to me. It will require a little background to appreciate. 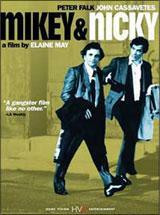 For the past fifteen years I have been searching for the shooting script of Elaine May's Mikey and Nicky, a film which I am convinced is one of the major works of American art. I have had copies of all of the generally available scripts (from Script City and the other usual sources), but I was told that all of the scripts that are in circulation were created after changes were made in the film by Cassavetes and Falk when they acted in it, after they changed their lines in improvisation. 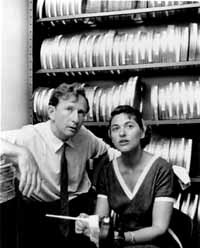 I wanted to see what Elaine May really wrote, before the actors made their alterations, which would of course then allow me to see what changes Cassavetes and Falk had indeed made in the script during the filming process. It had been a long and difficult and frustrating search. I had written to everyone I could locate who was associated with the film in any way, including Elaine May, and come up with nothing that wasn't already generally available. Things changed one afternoon this summer. A series of contacts let me to someone I had not contacted previously. After another series of phone calls and emails, a FedEx containing the original shooting script for the film arrived at my door. I spent the rest of the day devouring it, comparing it line by line with the text of the released film, laughing at scenes that had not made it into the film, untangling its complexities, loving every page of it, madly scribbling notes in the margins of a Xerox I made at the local Staples. It was one of the most exciting days of my life. In my mind, it was the equivalent of holding a previously unknown manuscript of Middlemarch or The Portrait of a Lady in my lap, or having a lost Picasso sent to me to study that no one else knew existed. It is hard to describe my excitement without sounding fatuous, but that afternoon I knew I was turning the pages of one of the great works of American art, and to add to my emotion -- that it was a work which no one had seen in more than three decades, a work which might otherwise have been thrown out and lost for all eternity. It was a miraculous day. My life was blessed. I shall probably publish an essay about the changes made in the film, based on what I have discovered, but scholarship is not ultimately about any attention that essay may or may not get (and, let's face it, it will get very little attention at best!). It is about the intellectual excitement of the search and the thrill of the discovery. THAT is what it is to be a scholar. And I would tell my grad students that if that doesn't ring their bells, if they need more worldly rewards (money, fame, power, recognition), they should find something else to do. -- R.C. 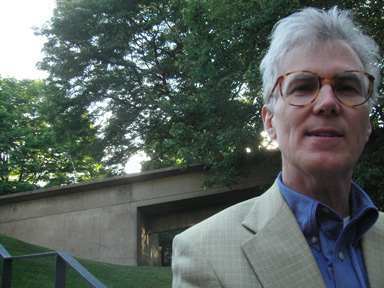 Engel is now dead, but as a young scholar just beginning my work in film, twenty years ago, I sought out Engel and had a series of conversations with him about his work and about the state of independent filmmaking in those early years in New York. He stunned me in one conversation by telling me that he had made a fourth film -- I Need a Ride to California -- that no one knew about because it had never been screened publicly. When I asked him if I could screen it, he was quite shy about it, and made excuses that the negative was in bad condition and that the editing had not been completed entirely to his satisfaction. I added it to my mental list of "lost" or "forgotten" independent works from the 1960s -- works that virtually no one had ever heard of, and had been ignored by film history. Lost, unknown, important works of American art. When Engel died ten or fifteen years later, I wondered if I or anyone else would ever see it, if the film would ever see the light of day or would remain unknown forever. I am glad to report that through the kindness of someone who was close to Engel, I was recently given a copy of the movie. It is a complex and interesting film (though, in some respects, a flawed work), but it is wonderful to know that it has not been lost or destroyed. I would not call I Need a Ride to California Engel's greatest work (that title, in my view, deservedly goes to the magnificent and touching Lovers and Lollipops), but it is good to know that it has been preserved from destruction -- and it is certainly worth viewing and thinking about. It has all of the earmarks of Engel's artistic personality that appear in his other work: his extraordinary visual sense and "eye," his fondness for non-Hollywood faces and expressions, his love of the unplanned moment, and his subtle sense of humor. -- R.C. 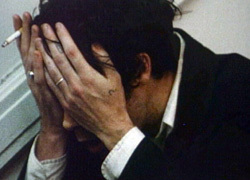 I see on your Cassavetes website that the Canon VHS release of Love Streams was cut down from its original 141 minute time to 122 minutes, 19 minutes being lopped out. I purchased a sealed 1984 Love Streams video released by MGM. The box and tape state a 2 hours and 2 minutes length, but starting from the Canon logo to the end of the closing credits, it ends up at 2 hours 20 minutes and 30 seconds. I also bought the French DVD release and the only thing seemingly missing from the VHS when comparing the two is the black leader and a couple seconds from the make-me-laugh dream sequence. Very strange stuff. Let me know your thoughts, if you wish. RC replies: Dean, your running time for the video is more or less correct, but the problem is that you need to compare the videos with the release print of the 35mm film. Comparing the French and American videos with each other doesn't cut it. (By the way, you don't seem to realize that I provided the text for the pack-in booklet for the French video--though I couldn't affect the edit of the film that was used.) The dream sequence has been re-edited (and cut) in both of the videos, if I remember correctly. If you saw the film, you would see the cuts and changes. The other issue that complicates things, and which I touch on at various places on the site (use the search engine, accessible via the blue ticket icon on most pages) is that the most recently struck 35mm prints of Love Streams themselves have other changes and cuts in them in other scenes as well, so that those prints are not the ones you should compare the videos with. As you can gather, this is all too complicated to summarize in an email. I intend to document the specific changes in both the videos and the recent film prints in a future publication. As to my response: I agree with you. Very strange stuff. What's the phrase Joe uses in Dickens' Little Dorrit? "It's a mighty puzzling world." I'm glad you and I (and a fellow named Allan McInnis who has also written to me about this) care, since apparently few others have even noticed the differences between the film and the video. -- R.C. Any near future plans for a screening of the original Shadows? We would love to see it at Cal Arts. p.s. JC is alive and well at this institution. Great to hear that John's spirit still haunts some halls of academe. Not at UCLA or USC, however. If you are keen on Shadows, just get someone to invite me. The only condition would be that we do the event(s) right: both versions, a discussion, a larger consideration, as would befit the occasion..... I'm not into quick and dirty events (as should be obvious from every syllable I've ever written!). That, as I think about it, would be the best way to do this thing. Four screenings, two versions of each film -- Shadows and Bookie (one an early film and one a late film), accompanied by a general consideration of how films can be changed in the editing and changed in their fundamental conception as they are created. That would be a great event, particularly if some other faculty members, there or elsewhere, were interested in participating and being on a panel or something like that. And that's what I mean by not having a "quick and dirty" event. Can you submit this idea to your programmer or faculty sponsor? Feel free to show him or her this email and ask them to get in touch with me. © Text Copyright 2007 by Ray Carney. All rights reserved. May not be reprinted without written permission of the author.